Taranis, the stealthy unmanned combat vehicle named after the Celtic god of Thunder, recently completed its first successful test flight. The British Air Force says it's the most advanced aircraft the UK's ever built — and based on sheer looks alone, we're inclined to agree. The semi-autonomous warplane is designed to fly intercontinental missions, and it'll eventually carry a number of weapons enabling it to attack both aerial and ground targets. It utilizes stealth technology, giving it a low radar profile. Taranis will be controllable via satellite link from anywhere on Earth. Test pilot Bob Fraser said everything went according to plan. But if you ask him how high or fast it flew he is not allowed to give a precise answer. He will only say Taranis flew at least "twice as fast" as any other drone he has operated from the ground. Eventually it is supposed to fly faster than the speed of sound. 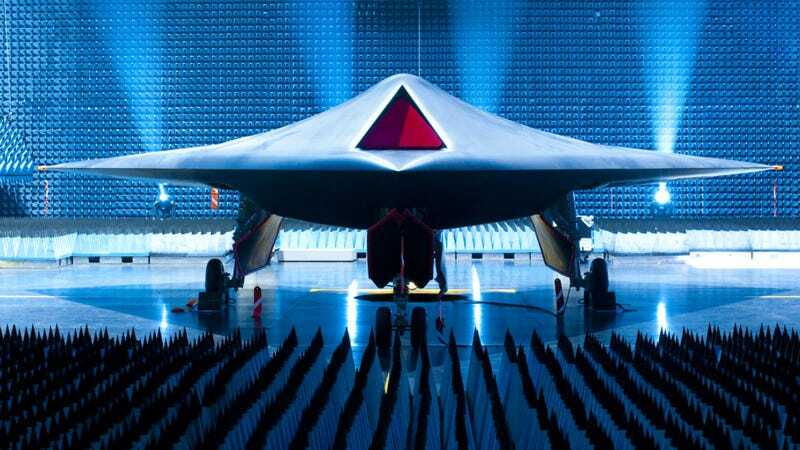 What we do know is that Taranis is the prototype for Britain's first stealth combat drone. It is low profile and acute angles are not just designed for speed, but also to avoid detection by radar. The goal here is to develop an unmanned plane that that can fly into "contested airspace" and deliver its weapons deep behind enemy lines. The obvious attraction to any politician is that if the technology proves effective such strikes could be carried out without endangering the lives of a pilot or aircrew. The US and China have their own stealth drones. And Germany is working on one, too. Hmm, Taranis looks suspiciously familiar. More at the BBC. Images: BAE Systems.